Q. 5: What is wrong with the Novus Ordo Missae? the people take over much of what the priest formerly did. 5. WHO made up the Novus Ordo Missae? 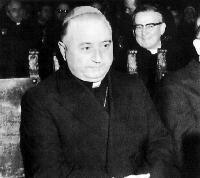 But the one on whose authority the Novus Ordo Missae was enforced was Pope Paul VI, who “promulgated” it by his apostolic constitution, Missale Romanum (April 3, 1969). 6. Or did Pope Paul VI REALLY DO SO? The dissimulation of Catholic elements and the pandering to Protestants which are evident in the Novus Ordo Missae render it a danger to our faith, and, as such, evil, given that it lacks the good which the sacred rite of Mass ought to have. We were promised the Novus Ordo Missae would renew Catholic fervor, inspire the young, draw back the lapsed and attract non-Catholics. Who today can pretend that these things are its fruits? Together with the Novus Ordo Missae did there not instead come a dramatic decline in Mass attendance and vocations, an “identity crisis” among priests, a slowing in the rate of conversions, and an acceleration of apostasies? So, from the point of view of its fruits, the Novus Ordo Missae is not a rite conducive to the flourishing of the Church’s mission. ...the rite and its related rubric are not in themselves a dogmatic definition. They are capable of various theological qualifications, depending on the liturgical context to which they relate. They are gestures and terms relating to a lived and living religious action which involves the ineffable mystery of God's presence; it is an action that is not always carried out in the exact same form, an action that only theological analysis can examine and express in doctrinal formulas that are logically satisfying. NB: It should be also be understood that the papal bull, Quo Primum is neither an infallible document, but rather only a disciplinary document regarding the liturgical law that governs the Tridentine Rite (cf. this Catholic FAQ for details). D. This being so, can it be said that the Novus Ordo Missae is invalid? However, the celebrant must intend to do what the Church does. The Novus Ordo Missae will no longer in and of itself guarantee that the celebrant has this intention. That will depend on his personal faith (generally unknown to those assisting, but more and more doubtful as the crisis in the Church is prolonged). Therefore, these Masses can be of doubtful validity, and more so with time. The words of consecration, especially of the wine, have been tampered with. 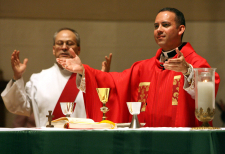 Has the “substance of the sacrament” (cf., Pope Pius XII quoted in principle 5) been respected? This is even more of a problem in Masses in the vernacular, where pro multis (for many) has been deliberately mistranslated as "for all". While we should assume that despite this change the consecration is still valid, nevertheless this does add to the doubt. E. Considering what has been said, are we obliged in conscience to attend the Novus Ordo Missae? Is the New Mass Legit? The Indult Mass: Should One Attend it All?